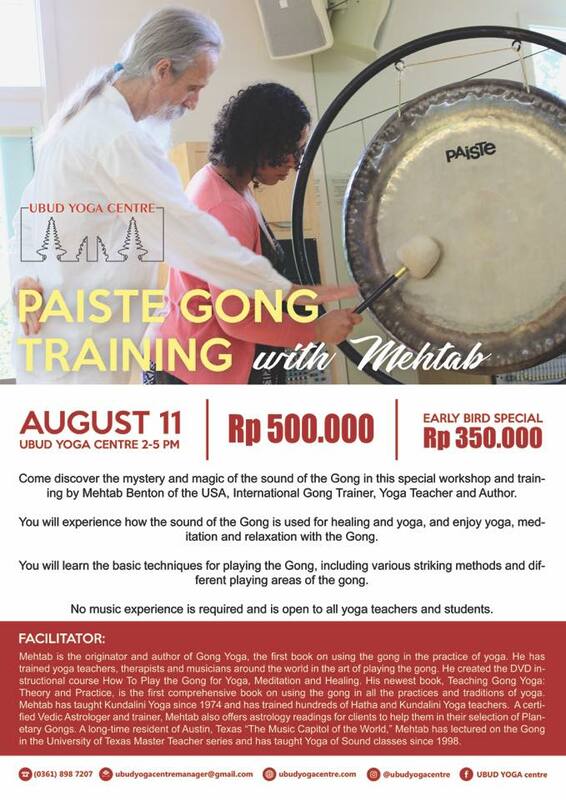 Come discover the mystery and magic of the sound of the Gong in this special workshop and training by Mehtab Benton of the USA, International Gong Trainer, Yoga Teacher and Author. You will experience how the sound of the Gong is used for healing and yoga, and enjoy yoga, meditation and relaxation with the Gong. You will learn the basic techniques for playing the Gong, including various striking methods and different playing areas of the gong. No music experience is required and is open to all yoga teachers and students. Mehtab is the originator and author of Gong Yoga, the first book on using the gong in the practice of yoga. He has trained yoga teachers, therapists and musicians around the world in the art of playing the gong. Mehtab has taught Kundalini Yoga since 1974 and has trained hundreds of Hatha and Kundalini Yoga teachers. A certified Vedic Astrologer and trainer, Mehtab also offers astrology readings for clients to help them in their selection of Planetary Gongs. A long-time resident of Austin, Texas “The Music Capitol of the World,” Mehtab has lectured on the Gong in the University of Texas Master Teacher series and has taught Yoga of Sound classes since 1998.